It's time for an outing! 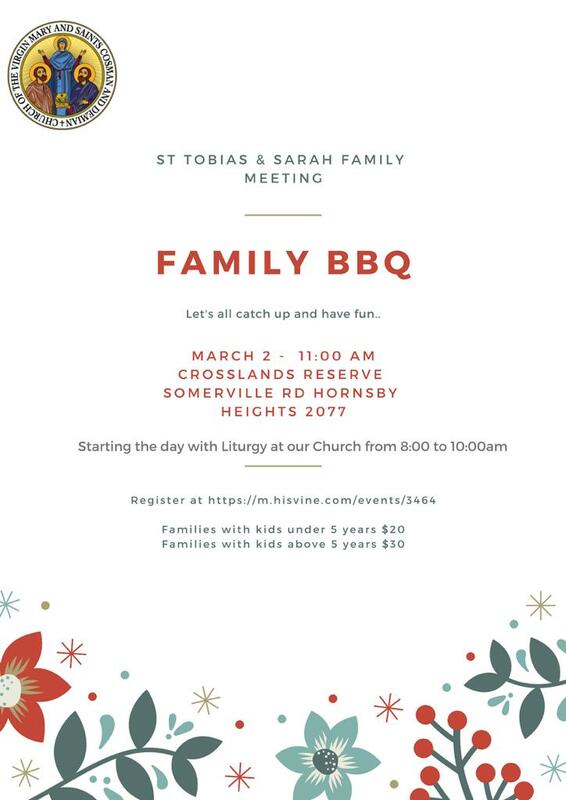 St. Tobias & St. Sara's family meeting is inviting you all for a gathering on Saturday 2nd March 2019. We will start our day by Liturgy from 8:00 to 10:00 am (@ our Church). We will meet in the park at 11:00 till 4:00 pm. Get ready for a BBQ at lunch, and warm up for the activities! The cost for families with children 5 years or under will be $ 20 and for families with children above 5 years will be $ 30. Payment to be deposited in the donation box on the day. Kindly confirm your attendance via Hisvine registration. For any queries please contact St. Tobias & St. Sarah family meeting servants. Hope to see you all there, to spend a blessed enjoyable time together. Please pray for Service. God bless you all.